Burien Bark Garden & Gift Center is a family owned and operated business that has been serving the greater Seattle area for over 50 years. The Clairmont family is the current owner and has successfully been running their business for the past 15 years at their retail yard located in Burien, Washington. Our mission is to provide superior landscape materials and garden products to homeowners and contractors with assured performance and a smile. Our belief in friendliness and honest dealing has remained unchanged for half a century and counting. We take pride in the quality of our products and customer support and look forward to providing both for years to come. We specialize in top quality Bark, Topsoil, Compost, Sand and Gravel. We also supply garden products, tools, gifts and accessories for the professional contractor and the everyday home gardener. Our products assist you in fixing and beautifying your yard, from the simplest, smallest project all the way to a complete landscape overhaul. When you come to Burien Bark Garden & Gift Center, you get old time friendly service backed up by our commitment that you will leave as a satisfied customer. You never have to ask for help; we offer it. We offer a fast and professional delivery service for all our products across the King County area. We want you to spend more time working on your yard than wasting time and money driving back and forth. 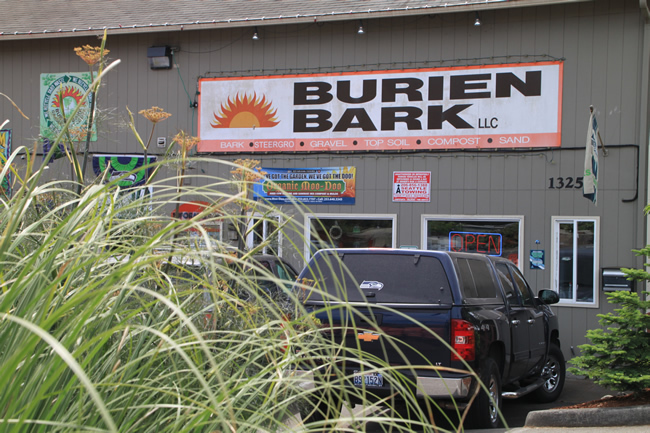 The friendly staff at Burien Bark can offer help and ideas on your yard projects. Don’t know how much material you need? Use our materials calculator for product quantity, or call us with your measurements – we will help you determine the right product and quantities for your project. Our retail yard is conveniently located on 1st Ave South and 132nd, just north of the Burien Fred Meyer. The loading yard is easily accessible. We are open 7 days a week for your convenience, so come on down and get your landscape or garden project started..